The UK’s premier courier company offering local, national and international courier van,truck and lorry deliveries to businesses and individuals. Simon Allan, Owner and Managing Director is a UK award winning courier industry owner who passionately believes in delivering outstanding customer service. After five years owning a courier franchise and becoming the UK Franchisee of the Year in 2009, Simon then chose to set up his own courier business. Point2Point Courier Service was established in 2010 and is going from strength to strength with a customer base of well over 50 regular customers across all sectors. The highly experienced and dedicated full time team of drivers pride themselves in understanding they represent your company once your goods are on board until they have been delivered. They focus on building long term, mutually beneficial relationships, one delivery at a time. Consistently delivering excellent customer service is not just our daily objective it is our collective passion here at Point2Point Courier Service. When it comes to sending important packages or pallets across Glasgow, Edinburgh, Scotland, UK and Worldwide it is vitally important to use a company you can trust and who gives you the crucial final ingredient called peace of mind, every time. That’s why Simon and his team at Point2Point Courier Service are a leading brand among couriers, package and pallet delivery companies in Glasgow and Edinburgh. We completely understand you demand a quality service with peace of mind that your delivery will 100% meet its deadline, intact, every time. Our modern fully liveried fleet network capability ranges from urgent dedicated couriers in small vans, larger vans including trucks and lorries. We use our years of experience in logistical planning to ensure we set out the most efficient routes possible whilst minimising client cost outlay. The P.O.D is captured digitally then emailed to the sender for every multi drop delivery. 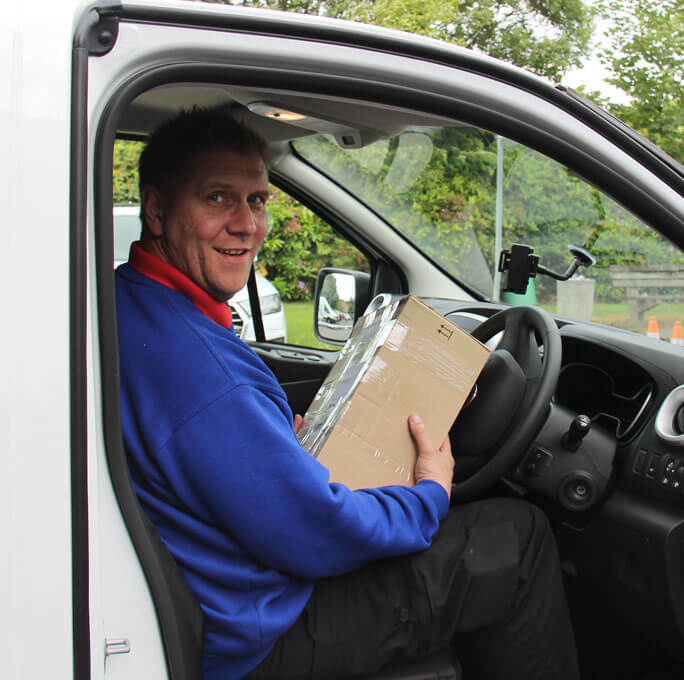 We will advise you of the quickest possible pick-up and delivery times whilst ensuring the swiftest method of delivery. You will receive actual proof of collection and delivery. The P.O.D is captured digitally then emailed to the sender. We are fully insured with goods in transit cover. We know we represent your company and brand while we are on the road. This is why our team of dedicated drivers always look professional in appearance, wearing our own branded workwear. They are fully briefed to ensure they meet Point2Point Courier Service’s exacting customer service standards.